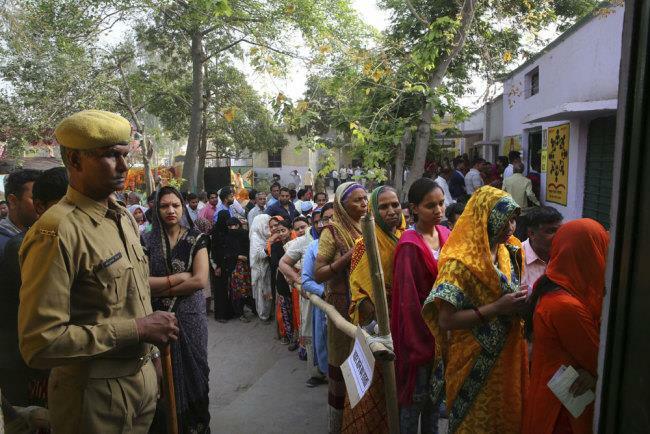 HYDERABAD, India, April 11 (Xinhua) -- The first phase of polling in India's general elections began on Thursday morning, and votes are to be polled in as many as seven different phases over the next 39 days. The first phase of polling began at 7:00 local time, and will continue till 18:00 local time. However, in other areas the polling timings will vary and end as early as 15:00 local time. People, aged above 18 years old, were seen standing in queues waiting for their turn to vote in Hyderabad, the capital city of India's southern state of Telangana. After casting their votes, they gleefully posed before the media to get clicked, showing their left forefinger marked with the indelible ink. Senior leader of the Indian National Congress (INC) and Member of Parliament belonging to the upper house-Rajya Sabha K.V.P. Ramachandra Rao was among the first voters to exercise his right to vote at one of the polling stations in the city's residential area Banjara Hills. More than 170,000 polling booths have been set up nationwide for the first phase of polling.